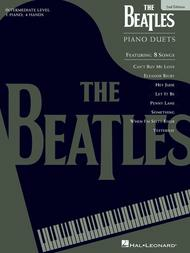 The Beatles Piano Duets - 2nd Edition (1 Piano, 4 Hands). By The Beatles. For Piano/Keyboard. Piano Duet. Softcover. 80 pages. Published by Hal Leonard (HL.290496).ISBN 0793583381. 9x12 inches.Features 8 intermediate-level arrangements for 1 piano/4 hands: Can't Buy Me Love • Eleanor Rigby • Hey Jude • Let It Be • Penny Lane • Something • When I'm Sixty-Four • Yesterday.